Jack and I love to paint and do so almost everyday. But we take breaks occasionally to renew our energy and see our work with freshness. We call this Sharpening our Axe. We had an appointment today with a special collector in San Antonio. Since we were going to be in ‘the big city’ anyway we decided to go to Central Market. What a cool store, it reminds us of the farmer’s markets in California. Fruits and Vegetables galore and the flowers are fabulous. 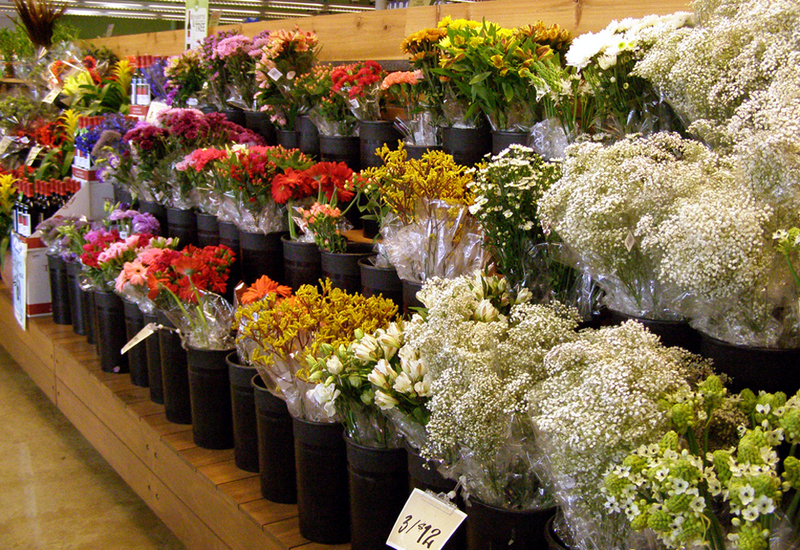 This is just one section of the flower market below. 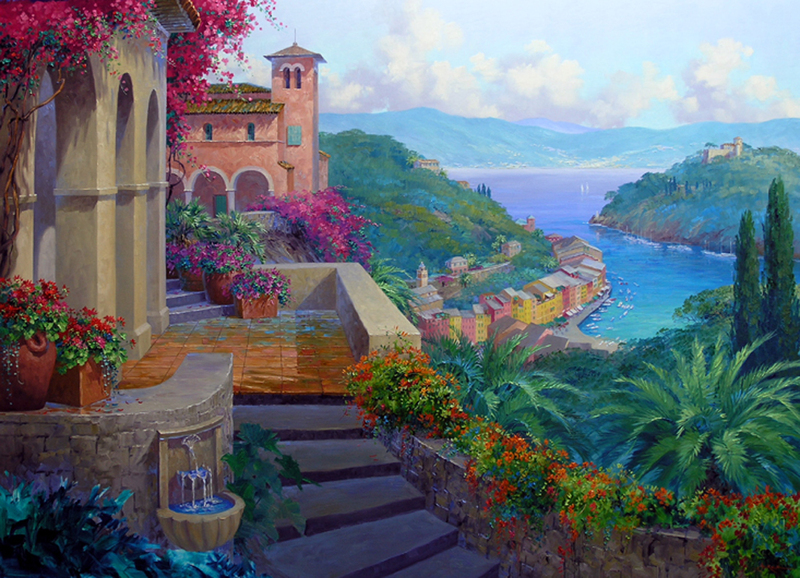 I could just set up my easel there and paint! Coming home we took the long way through the rolling countryside. It was such a beautiful, sunny day with the promise of spring in the air. We are going to have great wildflowers this year. We’ve had a wet, cold winter, just right for Bluebonnets, Indian Paintbrush and Blanket Flowers. I’ll be back at the easel tomorrow. My axe is sharp and I’m planning to paint sunflowers and the hilltop village of San Gimignano in Tuscany. COME WATCH. 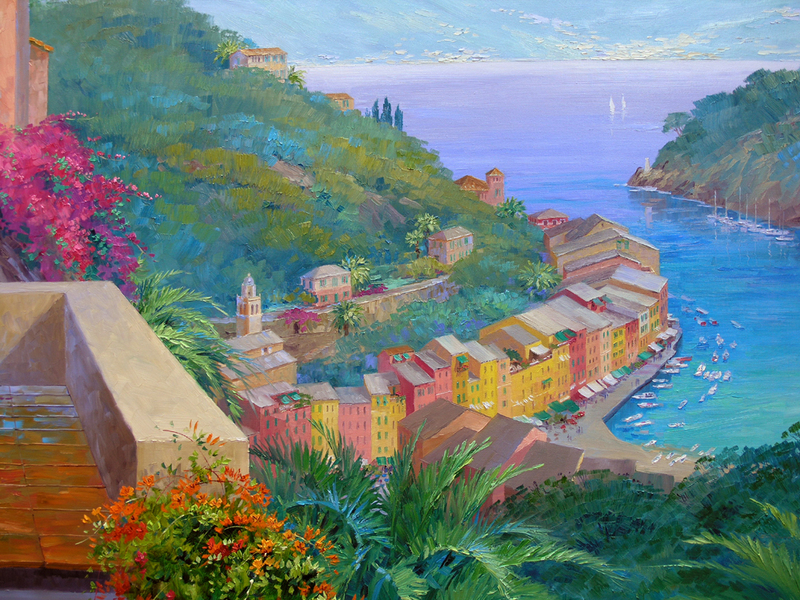 Let’s escape today to the beautiful Carmel coast, feel the brisk breeze on our faces and listen to the booming surf. This painting is 10″ by 18″. 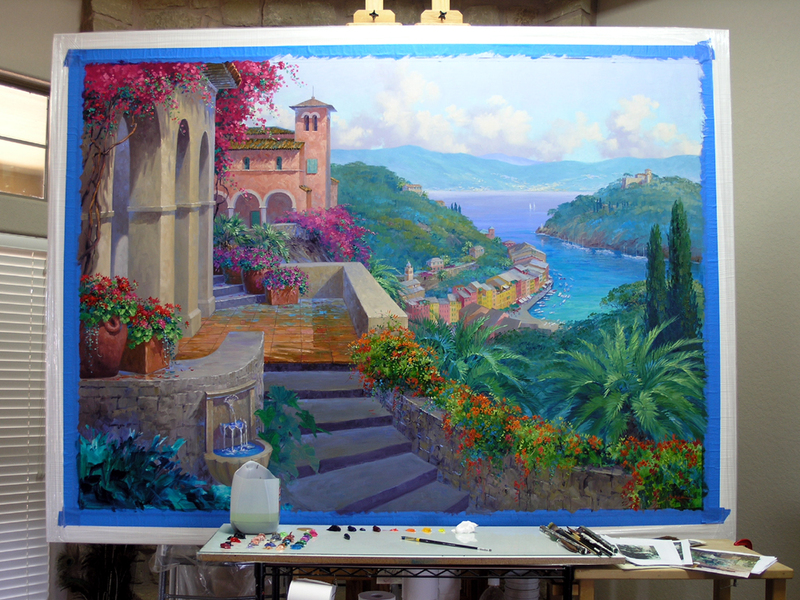 Looks pretty different on the easel after the 6′ by 8′ I just finished (smile). I start with a quick sketch in a thin oil wash of Mud: Ultramarine Blue + Alizarin Crimson + a liberal amount of Liquin. This establishes the major elements of the painting. Please do remember you may click on any image to see an enlargement. 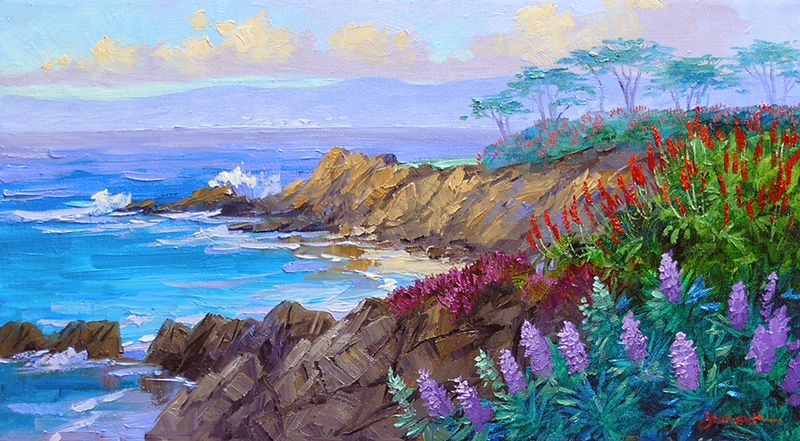 Beginning with the sky and distant mountains, I then move to the foreground and block in the dark mass of the Pride of Madeira, Aloe and Ice Plant that grow all along this rocky coast. Next step is the ocean using Ultramarine Blues in the distant water and more intense Pthalo Blues in the shallower, foreground water. 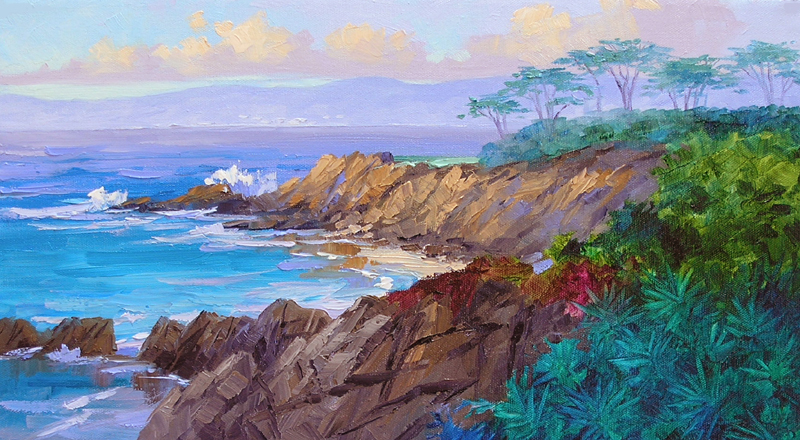 I want the sunlit cove to invite the viewer to come take a dip. Sunlight is hitting the point, washing the rocks with warmth. Since the rocks in the distance will be warm, I make the foreground rocks dark. 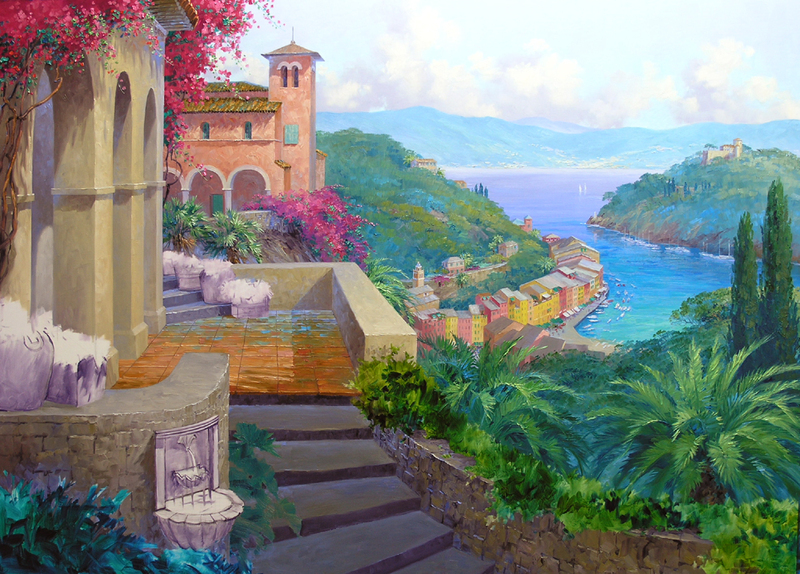 This is another way to give the feeling of depth in a painting. We call it the THRESHOLD RULE. Think of being outside on a summer night and looking back at the open door of your home. The warmth inside the door draws your view over the threshold into the light. 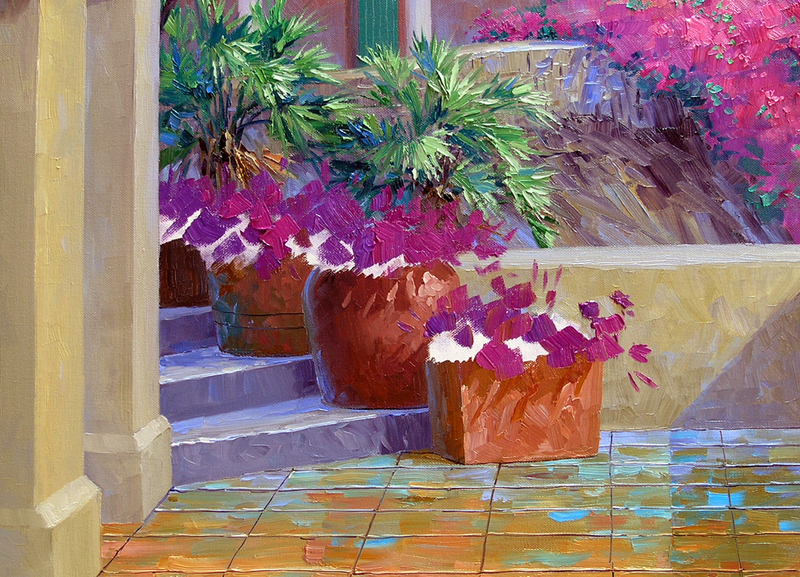 The dark rocks and plants across the front of this painting act as a THRESHOLD inviting you to step over to the little warm, sunlit beach. If you have a moment go back to yesterday’s post. 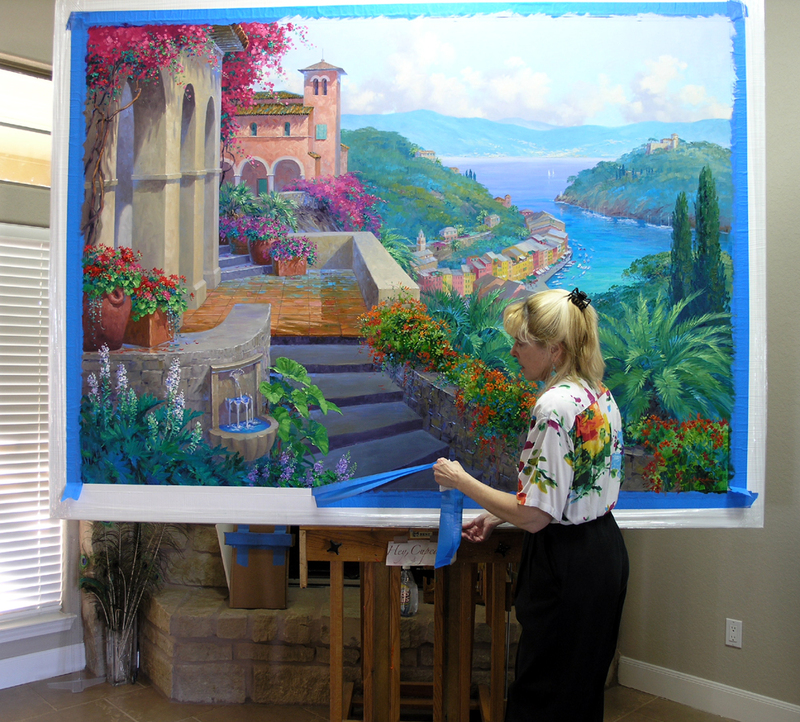 The 6′ x 8′ painting employs this same technique. The dark foreground of steps, rock walls and plants makes a threshold. The light on the terrace draws your gaze across the threshold up to the rest of the painting. The first time Jack brought me to Carmel I was overwhelmed with the beauty. We were familiar with the Red Aloe but didn’t have a clue what the stately plants with the purple flowers were. After questioning many of the locals we finally discovered their name, Pride of Madeira. Even though the plant is native to the Mediterranean we felt a better name would be Pride of Carmel! STEP 29 It’s a PEEL! The painting looks a lot different without the blue tape covering up the white frame. Jack came up with this method of framing when we lived in Hawaii. 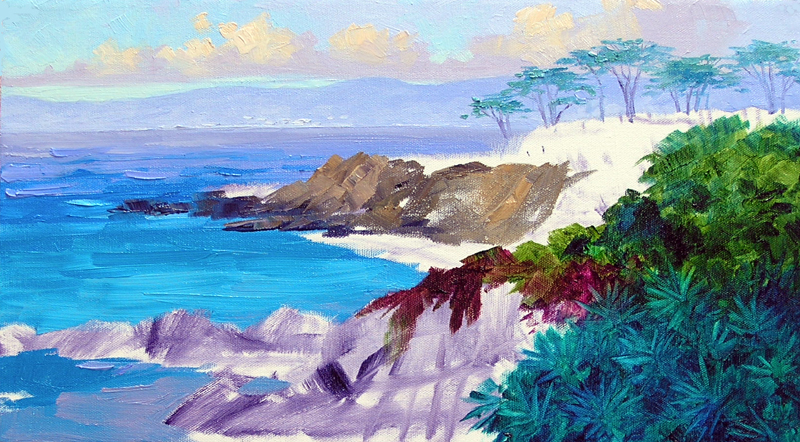 We were in several galleries both in Hawaii and back on the mainland, all wanting different kinds of frames. Being on the island it was very expensive to get the frames shipped to Hawaii and then ship them back again to the mainland with the finished artwork. So Jack developed our Senkarik Signature Framing and we have been using it ever since. Our collectors really like it and the colors in my paintings are much more vibrant with the white frame than in a traditional gold leaf or dark wood frame. To enlarge just click on the image. So… here is the finished painting. 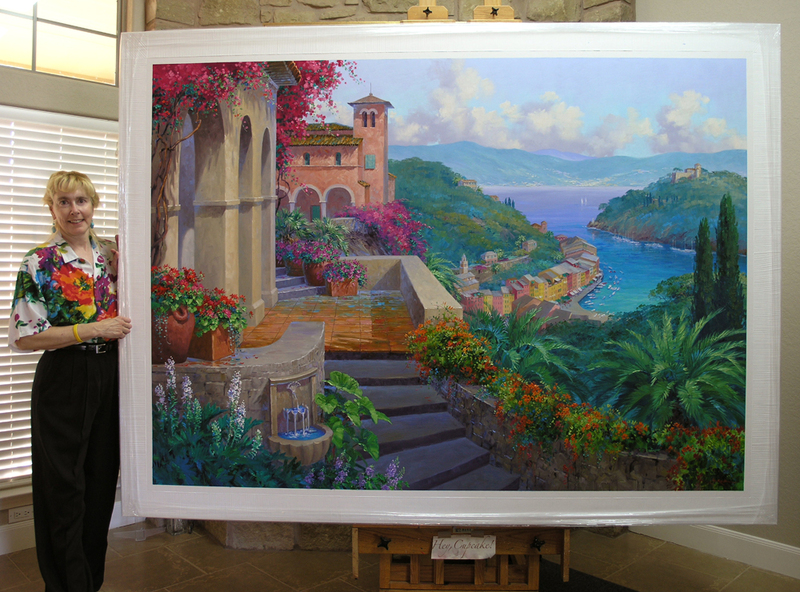 I have to admit it’s a very rewarding feeling to have completed a piece this large. It has been a lot of fun and I so appreciate you following along. Your comments have been welcome and very encouraging. Several of you have asked if I will continue to allow you to visit the studio and watch me paint. YES, a most definite YES. Please do keep coming back to see what is on my easel. Hugs, Mikki Senkarik. As a painting gets close to being done there always seem to be places where I need to go back and do a bit more work. This process is called PUSHING AND PULLING. On the right I’m softening the edges of the church because their sharpness was bringing it forward. As you can see in the picture below I’ve lightened and cooled the trees behind the buildings along the harbor. The dark trees behind the light rooftops drew too much attention. The hard edges of the rooftops were bothering me so I softened them to make the buildings drop back. I also added some laundry hanging out to dry from some of the windows. I just discovered something really cool that I’m sure most of you already know. I have to admit I’m computer challenged. But anyway, if you would like to enlarge any of the images in my blog just Click on the picture. Pesto, a larger image will pop up! If that larger image has a little + on it you can Click it again to get even bigger. I accidently did it and was so impressed I just had to pass it on to you. It’s time to fill the foreground planter with a selection of philodendron, bear breech & delphinium. Above I’m working on the philodendron leaves with a big brush, perfect for the broad planes of the foliage. This plant serves to break the large expanse of steps that give a dark contrast to the light hitting the elephant ear shaped leaves. The leaves will darken as they go down, allowing them to slip behind the flowers of the delphiniums. On to the bear breech. We have this wonderful bush planted on the edge of our back patio, it’s one of our favorites and a great model we can see from the studio. The purpose of this plant is to darken the lower left corner of the painting to STOP THE LIGHT. Light pours in from the upper right, the dark leaves of the bear breech stop it so it doesn’t flow off the canvas taking your eyes out of the painting. Instead the dark mass directs the viewer’s gaze back up to the terrace. I don’t want a lot of detail in the leaves in order to direct attention back to more detailed areas. The delphinium is now blooming. I picked lavender for the flowers so they will be there to help break into the step area without shouting “Hey, look at me!” I’m using the corner of the same ‘bright’ brush you saw in an earlier post to put in the petals of the blossoms. The fountain garden is finished and in full bloom, ready to do its job of Stopping the Light. By the way, congratulations to all of you New Orleans Saints fans on your Super Bowl win. It was a good game and how great for all the people of New Orleans! What tools are important to an artist? Our easel and palette of course. We’d be out of business without brushes and paints. And where would we be if we didn’t have something to paint on; canvas, paper or board? So…. what is it in the the picture of our studio above we couldn’t do without? The couch, you say. Artists take a lot of naps! NOPE, although I do sit on the couch to go through reference material. 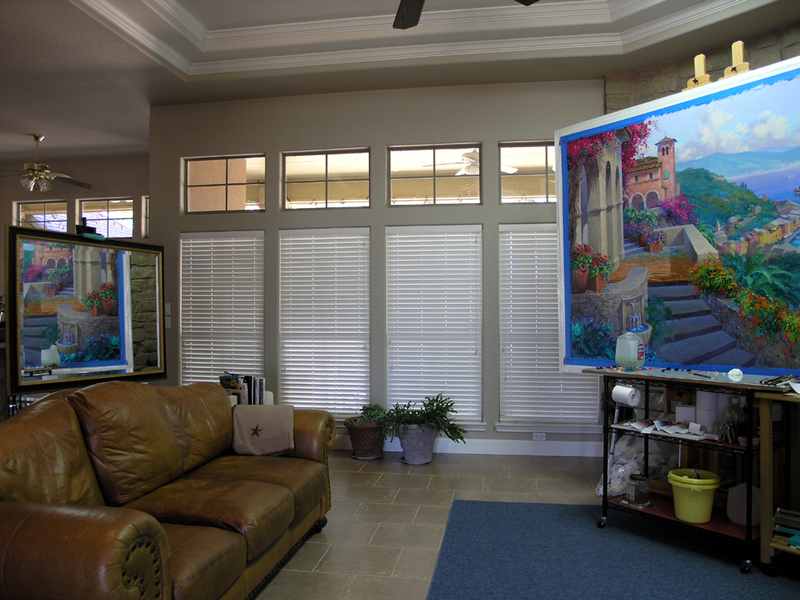 When clients visit the studio they can relax and watch me paint or we can sit to discuss ideas for a commission. Look again at our studio. One of the most important tools an artist can use is on the left, behind the couch. THE MIRROR! See how my painting is reflected in the glass? This is vitally useful in critiquing your own painting. Looking at your artwork in the mirror switches it from the inventive (creative) side of your brain to the analytical side. 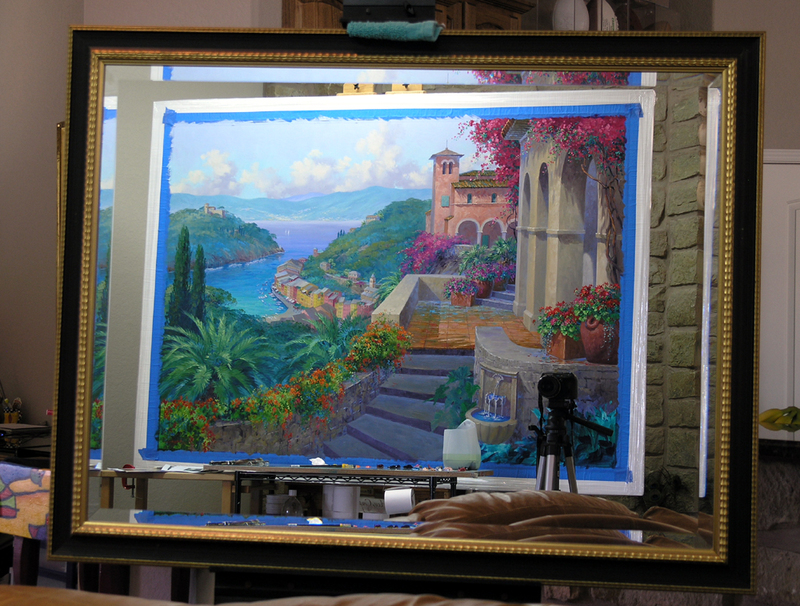 If you are an artist, using a mirror is an absolute must. You will be amazed how different your painting looks in reverse. Please come back tomorrow. Until then have a wonderful day. Jack and I will be watching the Super Bowl this evening. The trumpet vine is beginning to grow over the rock wall. I really like the way the oil wash looks so I’m letting much of it show. 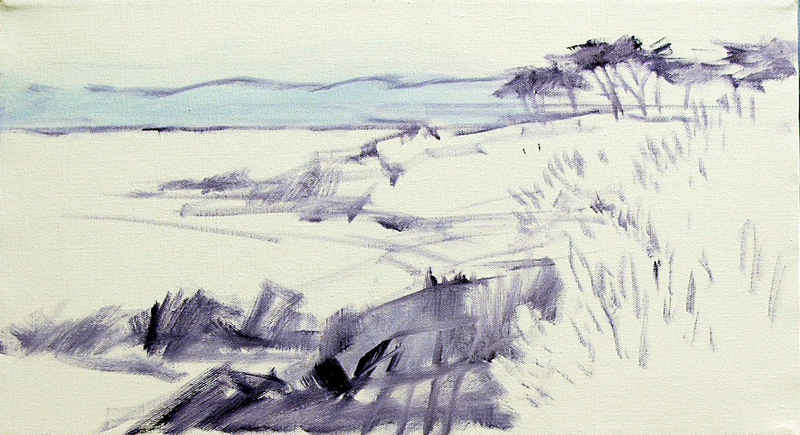 Usually I cover most of the initial wash with thicker, more opaque brushwork but am making an exception in this case. 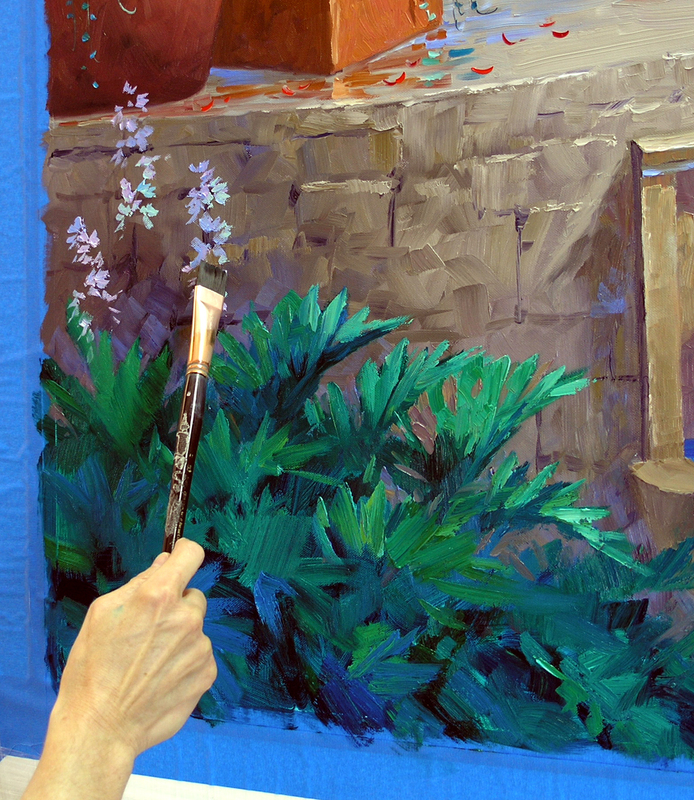 Using greens mixed with Ultramarine Blue and Cadmium Yellow Medium gives a warmer, muted hue as opposed to the bright greens on the geraniums mixed with Pthalo Blue and Hansa (Lemon) Yellow. The mix I’m using here is duller because both the Ultramarine Blue and the Cadmium Yellow Medium have a little bit of red in them. Red is the compliment, or across the color wheel, to green. Here is another rule in art: MIXING COMPLIMENTARY COLORS WILL MAKE THEM DULLER. Pthalo Blue and Hansa (Lemon) Yellow are pure, neither one have red in them so the green this mix produces is bright and intense. I’ve also mixed several orange tones, the darker ones have Alizarin Crimson, the lighter ones have Cadmium Yellow Medium. Since my oil wash is dry I don’t have to worry about it making my flower color muddy. But I still paint the flower color in first and then put in the thick brushstrokes of green leaves. You can see a big change in the painting now the canvas is completely covered with no white blotches distracting your eyes. This is such a fun moment when painting. My original ideas are coming together and working as I had planned. With bright, pure reds and oranges appearing in the foreground the background is dropping back. 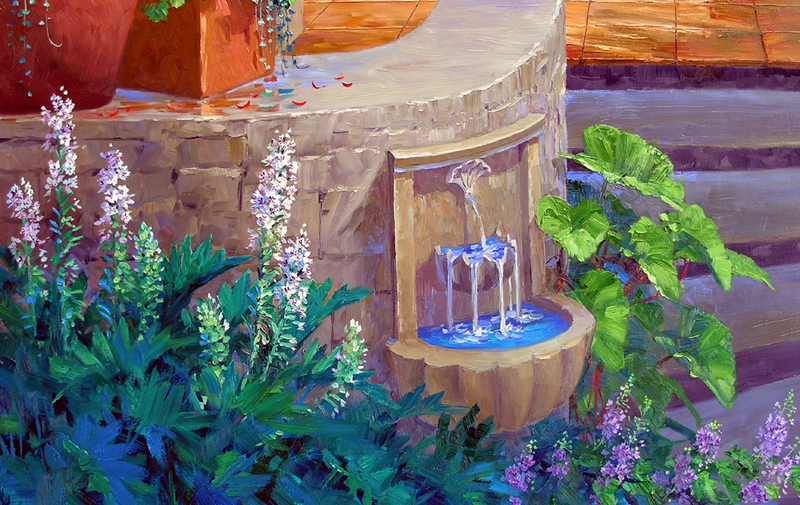 No garden is complete without a fountain or some sort of water. 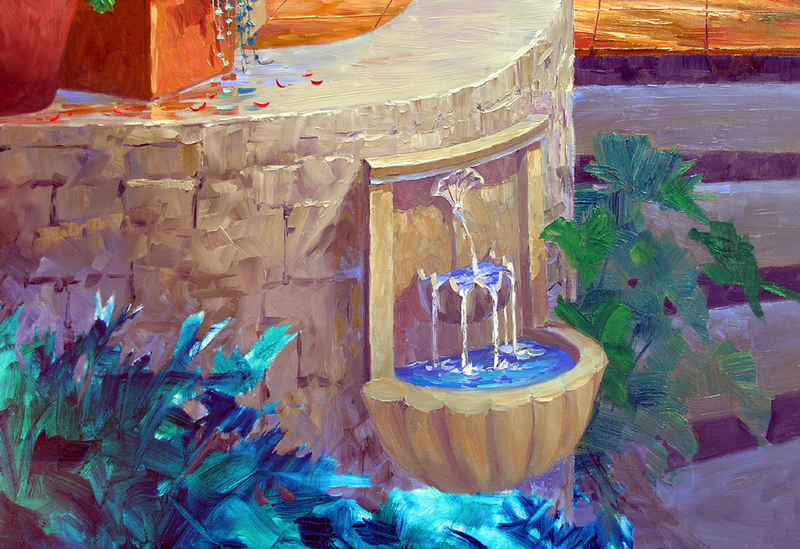 The sound of water moving is so welcoming which is why I made certain to have a water feature in this painting. Plus the birds in the area need a place to take a drink! My original idea was to make the color of the fountain a Grayish-Green stone. 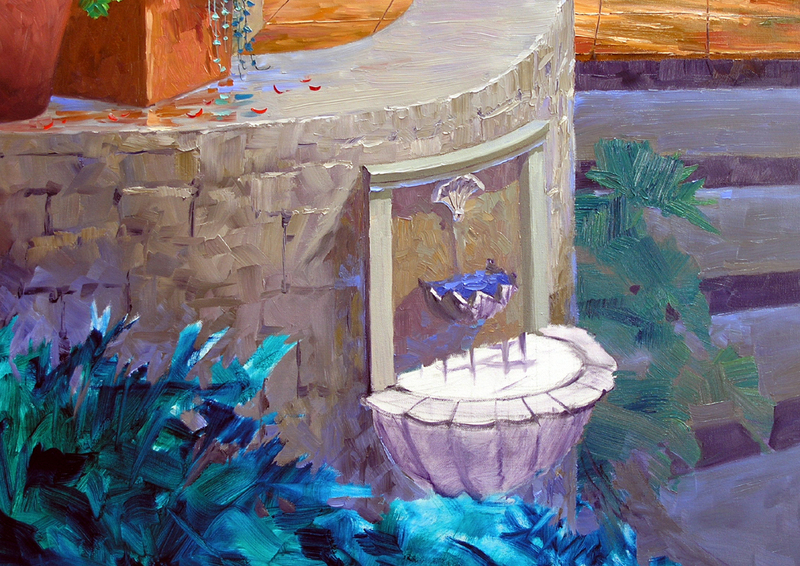 In the image above I have started painting the top of the fountain. The outer edges are the color I first had in mind, but I soon realized it didn’t have the contrast needed. So I switched to a warmer, richer color as you can see in the back panel. 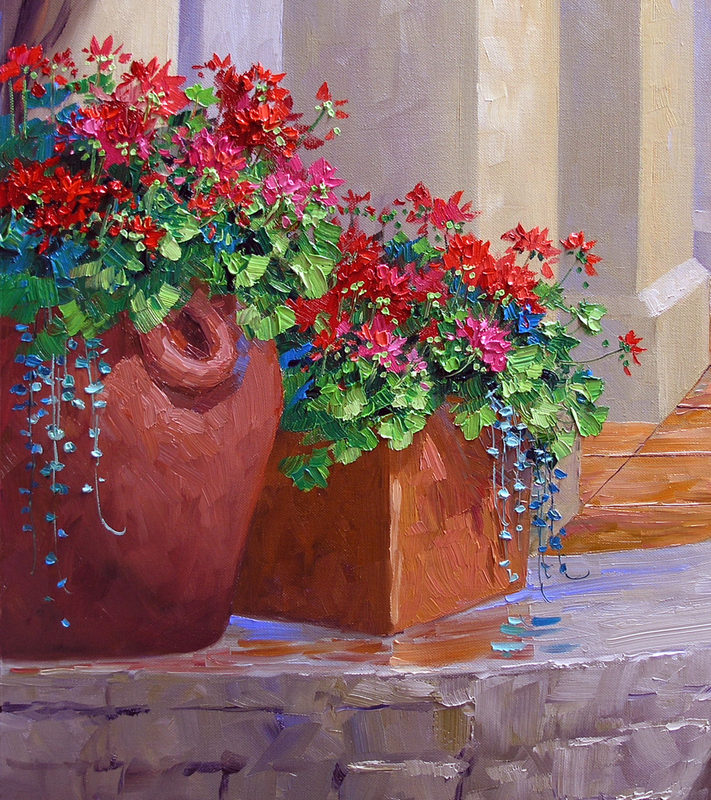 The warmth of the color brings the fountain forward. Oil painting is so forgiving. If you don’t like what is happening on the canvas you can just scrape it off and begin again. Sometimes what an artist envisions, just doesn’t work. 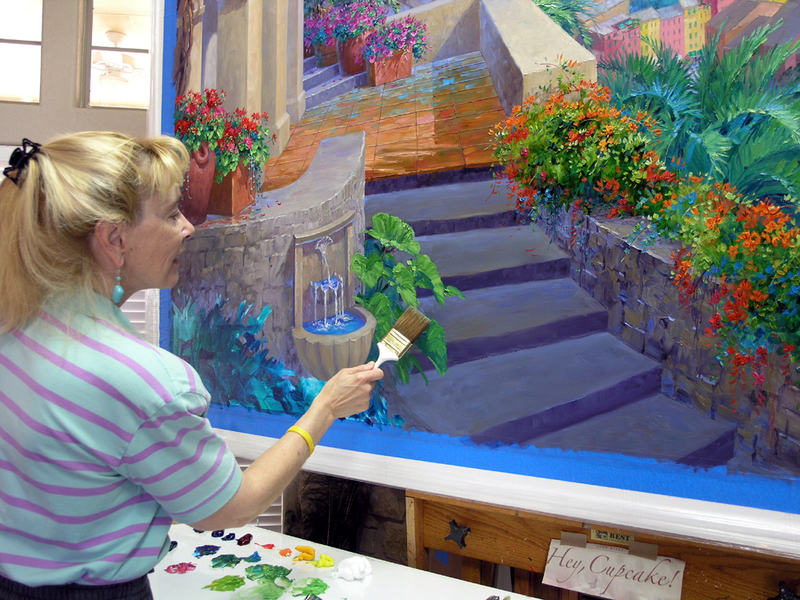 Painting is problem solving, making changes along the way to produce the best result possible. 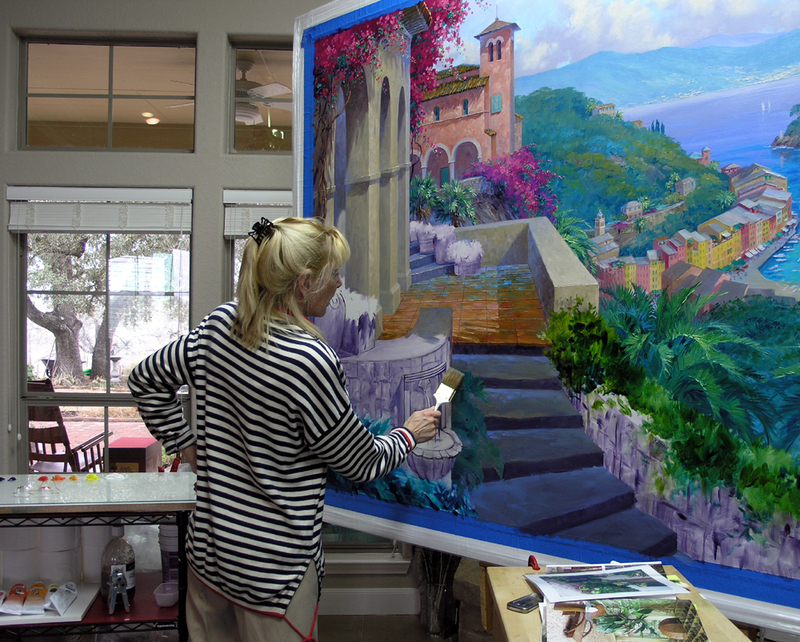 Painting is a lot like building a house: start with the land, construct the physical structure and then landscape it. 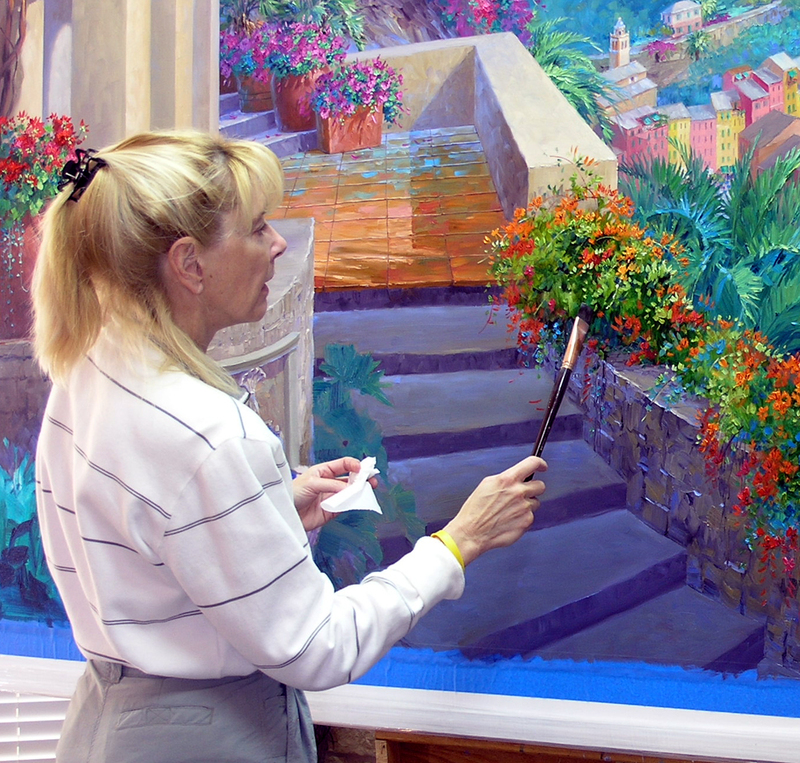 In making a painting I begin with the sky and landscape, then paint my buildings. Only when those are complete do I get to plant the flowers to add the final touch! Today I’m potting petunias and geraniums for the terrace. 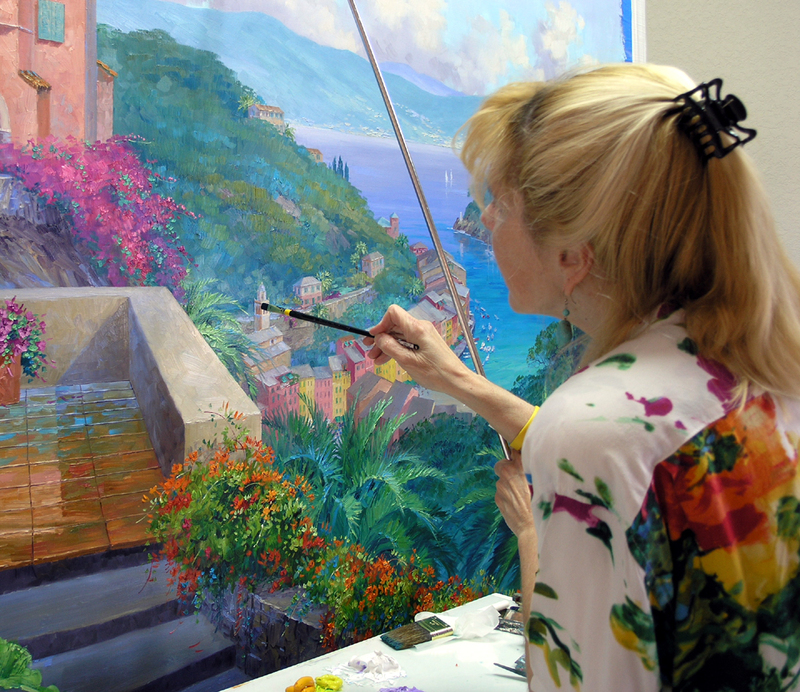 When painting flowers I block in the colors of the blossoms as you see above. Then the greens for the leaves are done, shown below. The flower color is put in first so the paint stays clean. If I put the greens in first, the purple and magenta of the petunias would pick up some of the leaf colors and get muddy. When the leaves are complete, I go back in to the flowers and add details as shown below. I also let a few of the flower petals fall to the floor. 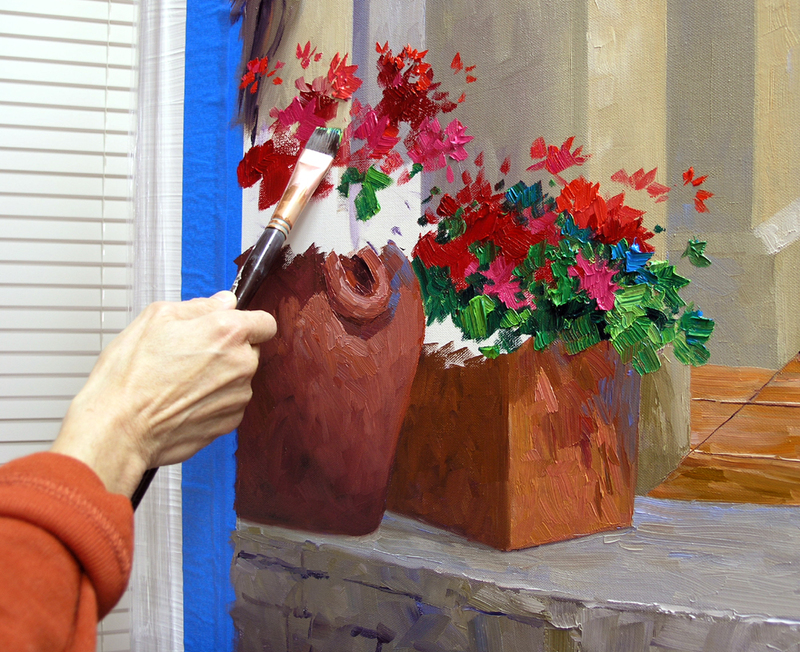 The same technique is followed with the geraniums. I like to use a square or ‘bright’ brush for the flowers. Held flat, like below, you can lay in broad stokes of color. 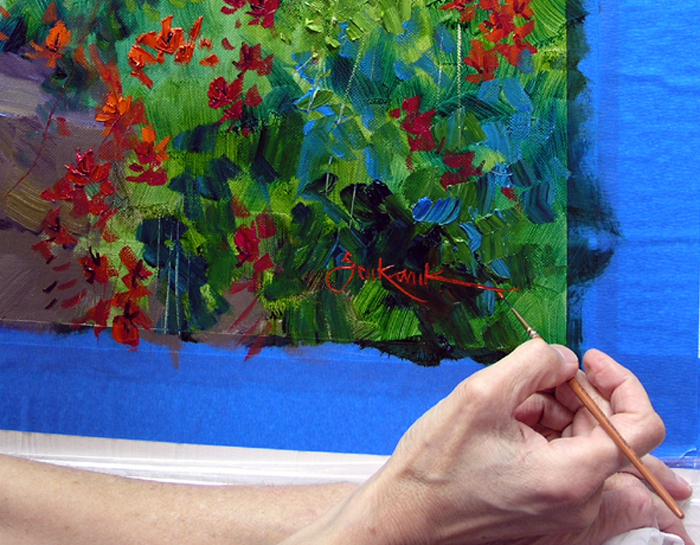 The smaller strokes of red are put in with the edge of the same brush. The reds are complete in the picture, I’m now painting the foliage. I use several shades of one green for the geranium leaves, here the mixture is Pthalo Blue and Hansa (Lemon) Yellow. 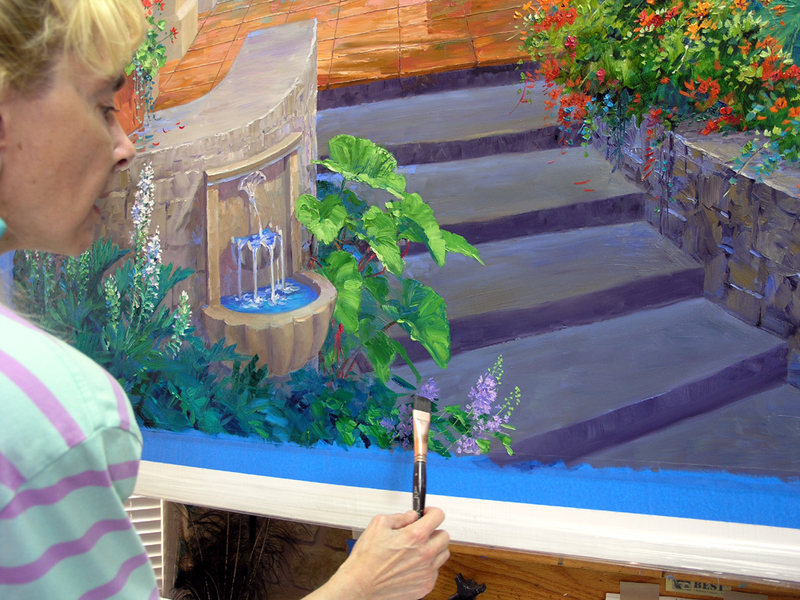 More yellow is used in the mixture for the lighter values, more blue for the darker greens. The second picture shows the completed geranium pots. Thank you for visiting our studio today. If you are new to my blog please go to the archives for January to see the beginning steps of this painting. Also check out my website: http://www.senkarik.com for more information about my art. Have a wonderful evening. Today work begins on the steps and the rock walls. I want the steps to darken and cool as they go down, disappearing off the bottom edge of the canvas. 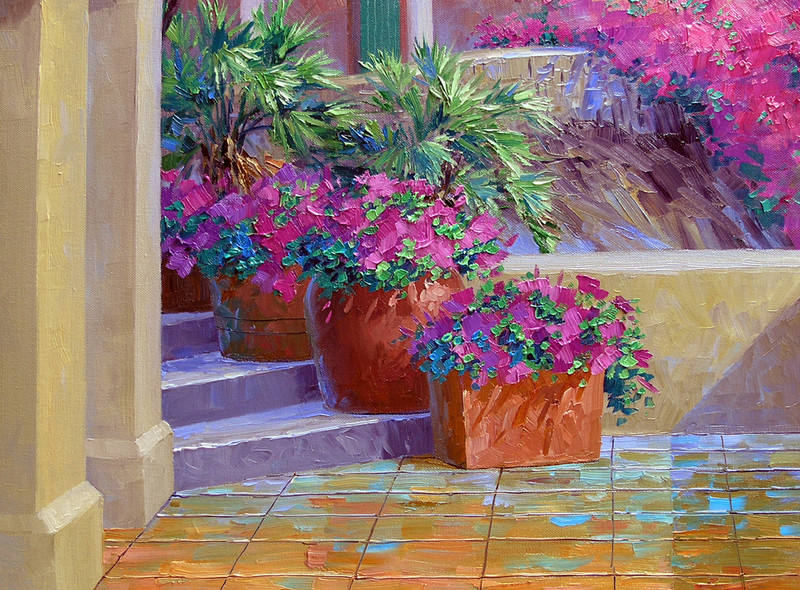 They will lighten and warm as they rise to the terrace, sweeping your eye up, into the painting. I know I sound like a broken record with this Warm and Cool stuff, but it probably is one of the most important concepts in representational painting. When I started painting Jack made signs and stuck them on my easel, refrigerator and bathroom mirror, WARMS COME FORWARD, COOLS GO BACK. I believe it finally soaked in (Smile). Now I sound like him! Above is my palette. 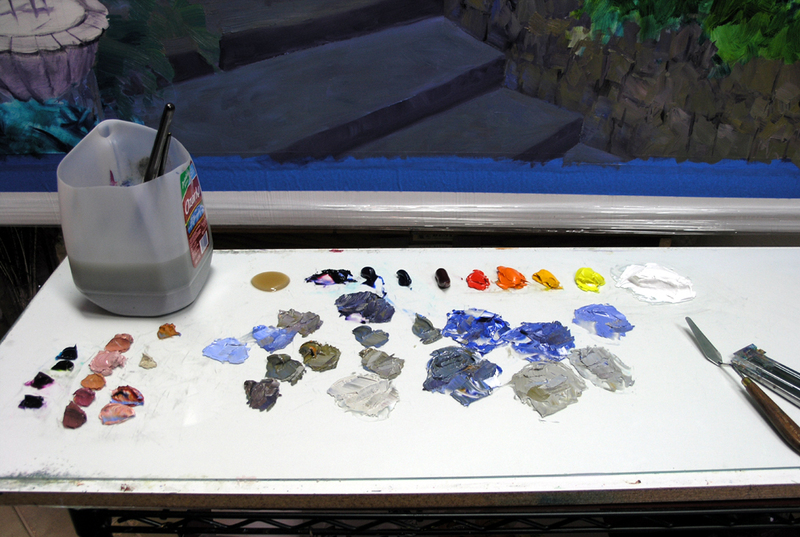 I saved the color mixes from the foreground arches and used them as the base to make the paint for the rock walls. I added various amounts of ultramarine blue, mud (ultramarine blue + alizarin crimson) and white to gray down the arch colors. The palettes we use are 1/4″ glass on a white shelf board. Because we paint on white canvas it helps to mix our color on white. 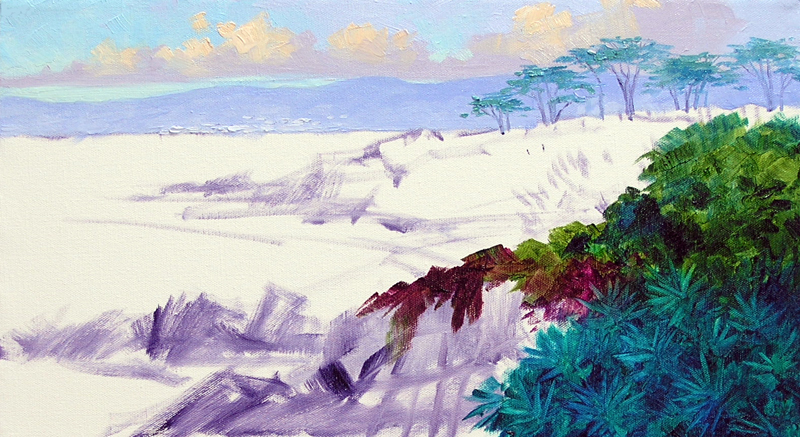 Some artists paint on a tinted canvas, however we like to use white canvas because the colors retain their luminosity. The glass makes for very easy clean up. We just use a painting knife and single edge razor blade scraper to clear up the paint. When painting the rock walls I try not to get too nit picky with the rocks. The tiles on the terrace are accurately delineated. The walls are more impressionistic, with just indications of the rocks. Early on I tried to paint each rock individually with very disappointing results. I finally learned to just mix a lot of color, smoosh the varying hues of paint around with my brush on the wall area and the rocks would begin to appear. Then I go back in, here and there indicating the indentations between the rocks. I hope this makes some sense.